At All Tomorrow’s Parties (26 October 2013, Palais Theatre, Melbourne), The Scientists took the stage immediately after Television had performed their Marquee moon album. A tough act to follow, so Kim Salmon adopted the only feasible tactic; a fast-paced, high-energy set that demanded the attention of an already-satiated audience in a cavernous theatre. Seven months later, a residency in the back room of Castlemaine’s Bridge Hotel (capacity 100) prompted a very different approach. Performing solo in a space the size of a living room, the classic rock’n’roll strategy—faster and louder—wasn’t an option for Salmon. On the surface of it, Salmon’s solution was to adopt the intimate ‘An evening with …’ format. 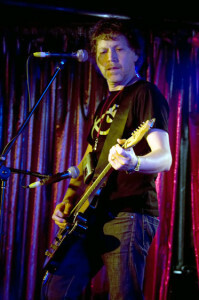 The set list ranged retrospectively across Salmon’s forays into Perth punk, Sydney swamp, Melbourne concept bands and sundry side-projects. Between songs there were musings on such things as the appropriate accent to adopt in rock music (a little bit of downtown New York, a little bit of River Thames), the pitfalls of guitar fetishism, his love-hate relationship with the blues and the relative merits of Liberace and Mark Knopfler. I say ‘on the surface’ because I think Salmon approaches the up-close-and-personal gig with an analytical mentality. I suspect he feels there’s no such thing as a natural kind of performance; even in a minimalist context—one guitar, practice amp, 30 people in the audience—there’s a degree of artifice and showmanship. In parallel, Salmon’s song-writing and recordings can read like a draft for a rock’n’roll version of the periodic table; his output ranges from primary elements (a one-chord song) through to hefty atomic weight of the mega-riffing concept-band Salmon (six guitarists, two drummers). For all that, Salmon’s performances at the Bridge were hardly clinical. A reflective mindset doesn’t make rock’n’roll bloodless; Lindsay Buckingham’s claim that ‘Dumb is a very important word in rock’ is seductive but doesn’t hold up under scrutiny. A critical awareness can be humorous, as in Salmon’s reflections on the kinds of lyrics drummers write. Above all, it encourages the audience to do more than await the delivery of their favourites. When these did arrive, Salmon invited closer attention; ‘Swampland’ was no longer a ‘grunge anthem’ but a song about landscape and longing, suddenly far more Australian in character than its swamp rock structure suggests.